Promotional labelled tea bags have photo quality printed labels on plain white tea bag sachets at great low quantities - unavailable on most other personalised Tea Bag ranges. 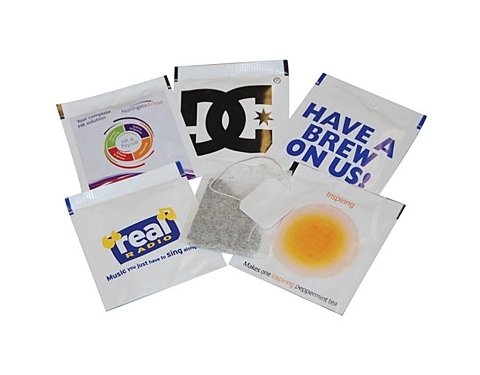 Get these teabags custom printed with your full colour graphics and brand for maximum exposure. Our prices include a quality breakfast tea bag with a plain tag inside a sachet printed to both sides. These tea bags represent one of the world's most popular drinks that is certain to draw attention to your brand with every cup. There is a full colour process setup cost of £45.00.